Fieldng and Throwing here at baseball for the beginners continues a segment on the fundamentals which includes the how to play baseball for our game of baseball just as we have already covered the basic actions for catching and hitting. This part of the game will also have some of that fear factor to contend with. Early on it is simple to get very small ones to try stopping a rubber ball rolling across a floor. Beginners by natural instinct will try to get in front of or in the path of a rolling ball and will try to stop the ball, this is rudimentary fielding of baseballs, with their hands and even their feet if it's about to get by them. Toddlers may already have an interest of how to play baseball and we never really have given it much thought as to what these small fry already know by instinct. Beginner baseball players know more as a matter of fact one heck of a lot more, than we would dare to give them credit, about them being able to get it right. Actually we might bore some of our beginner baseball players by not giving them due credit for having observed and intently watched the other older baseball players. As a general rule the small fry already know more about these baseball beginning actions than we give them credit. As long as we stay with that soft rubber or whiffel ball everything is fun and giggles. The first time a hard ball kisses those shins or on the lip a good one then the game is over for a spell. The "want to" will however soon become so strong that they will want to try it again. After the hearty spoken note of "Ball" will soon come the cry "Want To" for the "My Turn to" that is the doing everything they see their big Bubba doing. Let's pick up the tempo just a tad as the youngsters grow. One of the greatest repetitive practice methods for teaching and training of young players is the self taught action in fielding baseball grounders using a tennis ball. 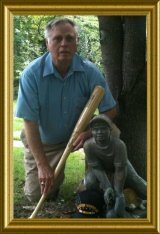 This beginner baseball training and practice can be done solo baseball fun one on one as in by his or her lonesome. 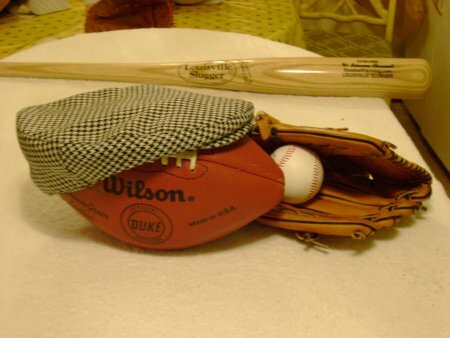 Grab your glove (the glove is not an absolute requirement) with a tennis ball, go into the front yard and start throwing the tennis ball against the front steps. The rebounding or return speed of the ball will return as fast or as slow as the youngster wants by how hard he/she throws the ball. The natural turf/grass of the yard is an ideal fielding of ground balls practice medium for the ball will make those crazy unexpected jumps, bounces and change of direction. Emphasize to the youngster to never leave his practice time until he or she has fielded at least five consecutive chances without a bobble. Youngsters need to be taught early on that the players with those sure handed grabs of that well hit baseball is what playing the game of baseball is really all about. The neighborhood kids, while growing up, know without question which of their teammates can be depended upon to have those sure hands for fielding ground balls. The kids who will start early with the sure hands and who will instinctively get in position and squarely in front of the ball will be the future Baseballs Gold Glove winners. This progrmamming must get into their mindset that it takes untold hours of practice to achieve real super fielding skills. Many ball players will not spend the time and effort for skill improvement therefore they are later on the ones who become lucky just to make the team and get a uniform. Square in front of the oncoming ball in a semi squating position feet spread with glove on the ground and watching the ball right into that glove is the ideal practice effort. The young beginners will know if they have fielded it clean or not so the rant and scolding is not neccessary on each bobble it takes time and it takes practice and coaches and dads must have patience with the young chargers. Beginners to grow into being those All-Stars are the ones who have that burning desire and the true "want to." Beginner baseball players as they began to really love this game of baseball will be so disheartened when there is no one available to play catch with them. Here is the solution help the youngster find, a close by two story building, a brick wall or maybe a barn with high sides that he can use. Now again with the tennis ball he can toss and catch till his hearts content. This vertical tossing against the high wall and the rebounding gives him excellent practice in the judgment of flight for chasing and catching those fly balls. He quickly learns even without coaching that he must move and reach because that ball never comes back the same each time. What to teach beginning ball players about fielding? Always, Always and I mean Always get in front of that ball. The Cardinal rule of Baseball is "never let a ball go past you". This rule written in red is to emphasize the importance of using the legs and footwork to get square in front of the ball and to keep the glove down and scoop dirt and ball both if necessary. Players forming a habit or reaching to the left or to the right ouside the shoulders are lazy players and are never destined to be the complete ball player he could be. Instill to the eenth degree the required value of footwork and movement to get squarely in front of that ball. Then simply bend from the waist a slight bend of the knees (you got it) to a squatting position. Just as if they were trying to pick up one of the new State Quarters from the ground. Glove hand and free hand open to the ball and simply scoop that quarter from the dust. Keep that glove down on the ground. Let the ball come to you. Beginner baseball players must learn to play under control, do not get excited, do not hurry, simply gather that hoss hide in and flip it on over to first base for that easy out. The eenth degree that is about as high as I can count. So please place special emphasis on that point just for me! You probably be surprised when you start to instruct the toddler the overhand action for throwing baseballs for he or she has already observed others throwing baseballs. Coaches and Dads we must be ever vigilant that our beginner baseball youngsters are not in training at this stage of life to be the future Cy Young Award winning league pitchers. Here is one bit of advice about throwing that I bet will surprise most of you. The key to throwing i.e. with power, speed and accuracy is the legs in combination with extended arm leverage and wrist motion. Have you ever heard of that old phrase "As momentum goes Mo goes"? Me either. Basic laws of physics are in play when it comes to throwing a baseball using the entire body motion starting from the legs upward. Young beginning ball players should be taught early that throwing a ball as hard as you can is not a natural function for the arm to withstand. The elbow and shoulder are not really designed to withstand the excessive torture we place on that limb. Protection of our young beginning ball players is the responsibility of older and wiser teammates and coaches. Not to worry! With training and conditioning, we can well endure and overcome our frailties, and become real winners. To play this game of baseball we will tend to ignore this fact many times to the detriment of our younger boys and girls. Let's you and I insist that these beginner baseball players learn to use the whole body especially the legs, in "harmony of motion with the arm" when throwing baseballs. Basically just have them relax and step toward whatever or whoever they want to toss that apple. Step and bend is the key. Using the legs to step and push off with some oomph! when releasing the ball gives ole "MO" a chance to work. Now we've got the hang of it...Right...? One drill which will reinforce developing the habit of good technique, and reinforcing in the minds of the young beginner baseball players after release of the ball, to continue into the motion (as follow through) and pluck a blade of grass from the turf. I think we (you and I) have about covered the basics of catching, hitting, fielding and throwing so after practice we will hustle down to the creek and take a good cooling swim. My hope is that this web site will provide more than ample insight and good information and significant value to growing a better ball players. Did these four pages or so give you a better feel and understanding and appreciation for training of beginner baseball? Beginner Baseball is the place to start but there is much more so check out more of the pages such as Learning About Baseball. Click here will return you back to the starting page of beginner baseball for a good refresher review. Go Shopping Online Why Not? You'll Surely To Be A Winner Helping Baseballfarming Win Is Win Win.